A couple of hours before dawn in Kapawi, a village in a remote corner of the Ecuadorian Amazon, a group of men gather to drink litres of tea made from the guayusa plant. One by one they then disappear into the dark to vomit. This ritual, known as guayusada, is designed to purge and energise and culminates in a sharing of dreams from the night. It was during one of these ceremonies more than half a century ago that a dream was shared of a “canoe of fire”. And this dream has recently been realised for the Achuar. 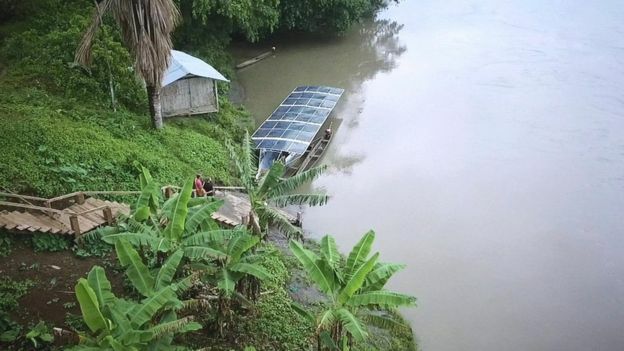 Since April 2017, a canoe powered solely by solar energy travels back and forth along the 67-km (42-mile) stretch of the Capahuari and Pastaza rivers that connect the nine isolated settlements that live along their banks. 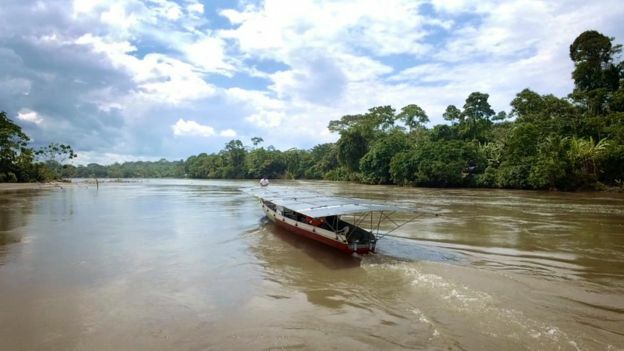 The boat Tapiatpia – named after a mythical electric eel in the area – gives the Amazon its first solar powered public transport system. 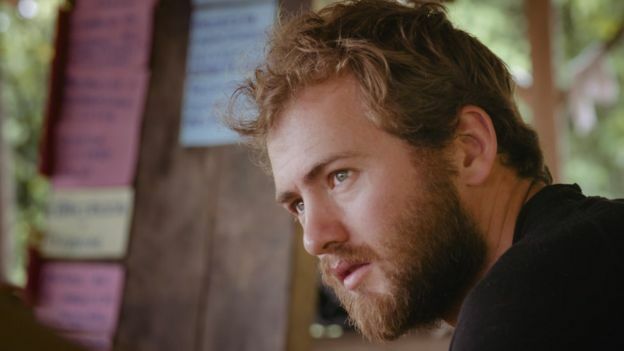 “The solar canoe is an ideal solution for this place because there is a network of interconnected navigable rivers and a great need for alternative transport,” says Oliver Utne, a US environmentalist who has been working with the community since 2011. The community previously relied entirely on gasoline canoes, known as peque peques, but they are expensive to run and only owned by a few families per village. 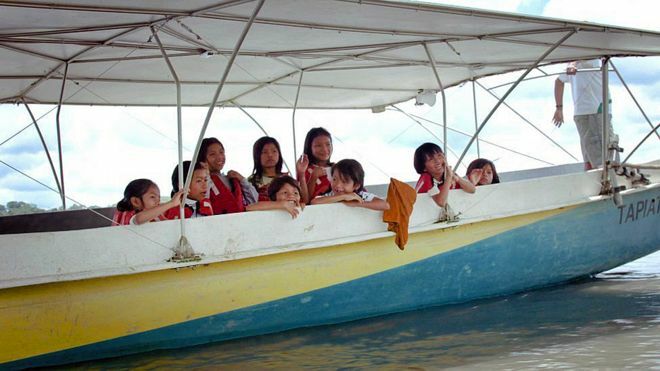 The canoe costs passengers just $1 (71p) each per stop, whereas peque peques cost $5-10 in gasoline for the same journey. Gasoline costs five times more here than in the capital Quito because there are no roads and it needs to be flown in. Of course there is an environmental impact too – the canoe means no pollution in one of the world’s richest areas of biodiversity. 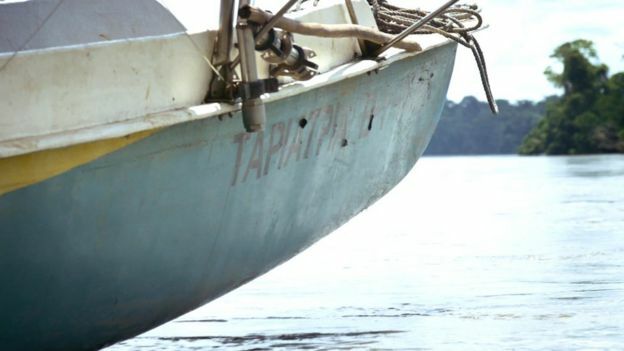 With a roof of 32 solar panels mounted on a traditional canoe design of 16 x 2-metre (52 x 7-feet) fibreglass, Tapiaptia carries 18 passengers. Its navigator, Hilario Saant, tells me how the canoe is changing lives. “We are helping the community when there are sick children. They call me on the radio and we take the children to the health centre,” he says. Similarly, more children are now at school because it is more affordable, and there are more inter-community sports events too. Suddenly, our conversation is interrupted by the excited scream of one of our fellow passengers as they spot a school of pink dolphins. Another advantage of the boat is that its relative quiet doesn’t scare the animals. Back on dry land Julián Ilanes, a leader of the Territory of the Achuar Nationality of Ecuador (NAE), tells me about the wider opportunities provided by the canoe. Numerous territorial wars have severed the connection between the Achuar in Ecuador and their cousins over the border in Peru. Mr Ilanes hopes to re-establish trade between the two, something that has thus far been economically impossible due to the distance and the cost of gasoline. “We can bring clothes and rubber from Peru, and they need green bananas, chicken, and peanuts from us,” he explains. And the canoe helps strengthen the community’s resilience against the construction of roads. 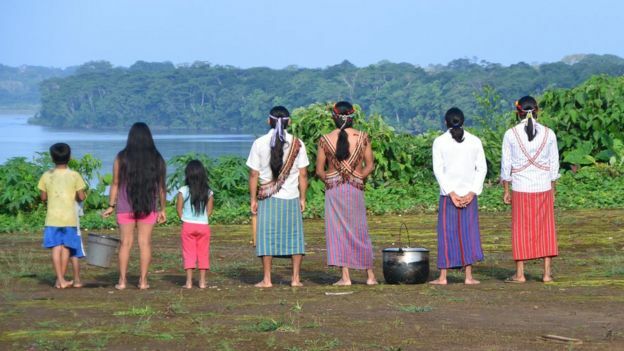 “Having no roads helps us to maintain our culture, to have the wisdom not to forget what the Achuar culture really is,” says René Canelos, a 27-year-old from Sharamentsa, one of the villages served by the canoe. The arrival of roads in indigenous communities in the north of Ecuador and in Peru has led to development and oil exploration, and with it, deforestation. Ecuador’s government has argued that roads will improve the Achuar’s access to health care and education, so the canoe helps the community prove they can manage without them. 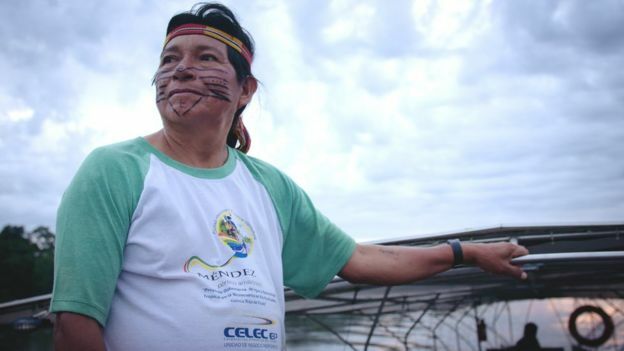 “The neighbours who let the oil companies in not only saw how this destroyed their forests, but also how it created a lot of internal conflicts because not everyone knew how to take advantage of the money that came in,” says Felipe Borman, a traditional canoe manufacturer. Mr Borman has come to work with the Achuar on a new prototype of the boat because its current engine, originally designed in Germany, is struggling with the Amazon’s hot sandy stick-strewn waters. 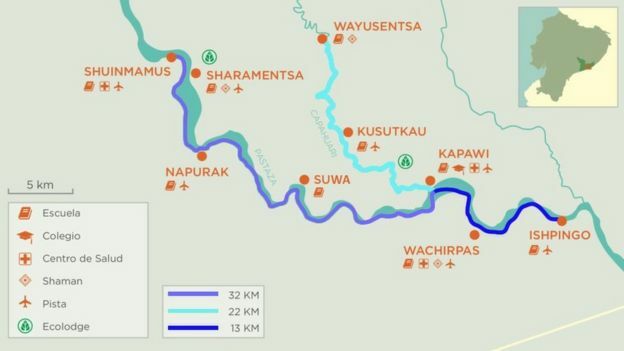 The ultimate dream for Mr Utne and Mr Saant is a whole network of sustainable solar canoes navigating these ancient Amazonian highways. 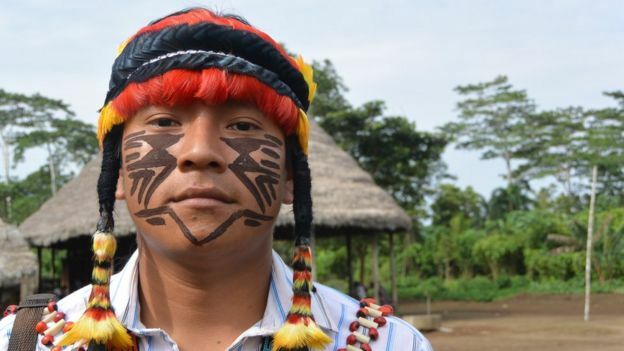 “We really think this can be a model for the rest of the Amazon, and also other places around the world where there is difficulty in accessing gasoline, where there is no road network, and there’s ecosystems that the local people are working to preserve,” says Mr Utne. But he says the key element is that it was designed first and foremost to work locally. “What we need is to create local solutions, and if they work, replicate them in other places,” he says. At the local level, at least, the difference is palpable. “I love my boat… it’s a dream come true for the Achuar,” says Mr Saant proudly.